Some of us that were formerly known as the WRPA Athletic/Fitness Section are hosting our second 2014 Sports Coordinators Brainstorming & Networking Meeting next Tuesday, April 29 at the Puyallup Recreation Center from 10 a.m. — noon! We held our first networking meeting in January and Tukwila and had a great turn-out. We hope you can join us and share your success as well as some of the struggles you might be having. If you are unable to attend, you can listen in via conference call. Get information on the conference call and RSVP by emailing marlus.francis@tukwiliawa.gov. What things should you do to select qualified contractors and consultants in a way that complies with laws and regulations? Join instructor Mike Purdy from Michael E. Purdy Associates, LLC as he discusses best practices and answers your questions. This event is free and very informative! 2014 WRPA Software Symposium — New vendors added! May 28, 8 a.m.-5 p.m. | May 28, 8 a.m.-12 p.m. There are now new vendors that will be attending the Software Symposium! The WRPA 2014 Software Symposium at the Tukwila Community Center and is a two day event you will not want to miss. WRPA will have nine Parks and Recreation software companies present their products during this two day symposium. There will also be a Showcase & Demo room in which cities can individually speak with nine software companies if they have additional questions. Saturday, May 17 - 10 a.m.
We are ecstatic to announce the Dedication Ceremony and Grand Opening for our own unique Meadow Crest Playground! Clamber over the 25-foot long caterpillar, ramble up a rock wall, strike the chimes and roll on a wavy walk. Bring your inner child, the neighbor's kid and a sense of playful adventure. Join the City of Renton, Renton School District and Highlands neighborhood for a memorable event you won't soon forget. For more information, call 425-430-6600. Park Resources Section presents Outstanding Field Staff awards at annual conference! The Park Resources Section awarded Justin Wilkinson and Mike Bowers, both from City of Bellevue Parks & Community Services, the 2014 Outstanding Field Staff award. Wilkinson is a grounds crew leader responsible for sports field maintenance and Bowers is a structural crew leader responsible for building and playground maintenance. Recognition was also given to Adam Partin with City of Olympia Parks for being nominated. Congratulations to you both! 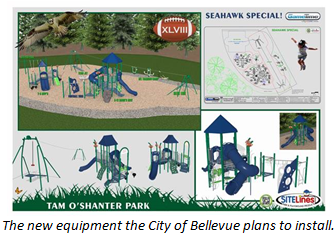 On May 3-4, the city of Bellevue will be replacing the playground equipment at Tam O'Shanter Park. The existing equipment is obsolete and parts for its maintenance and repair are no longer available. The city is looking for 24-30 volunteers (12-15 each day), age 18 or older, to help with the installation of the playground equipment under the supervision of the equipment supplier (SiteLines Park & Playground Products). If you would like to volunteer, or have any questions about this project, please call Lisa Brown at 425-452-6454 or e-mail lmbrown@bellevuewa.gov. We value the opinion of our readers and now that this newsletter has been around for just over a year, it's time to get some constructive feedback on what we can improve and what you want to read. Help us by taking this five-minute survey. A disease that afflicts sea stars has taken root in Pacific waters from Alaska down to California, including portions of Redwood National and State Parks. Biologists say this year's mass mortality tied to the disease is "unprecedented." While the cause of "sea star wasting syndrome" hasn't been pinned down, biologists believe it has to do with ocean waters that are warmer than normal. The house that has been on the site of the future Puget Ridge Edible Park came down under the claw of construction equipment on April 21. This project, selected for the first round of Parks and Green Spaces Levy Opportunity Funding, will now move into its next phase. The concept is to create an urban community farm which is a neighborhood meeting place, a community food garden and a test site for environmentally conscientious sustainability. Several residents want Olympia to buy a chunk of urban forest and turn it into a park. The biggest obstacle, however, is money. The LBA Woods Park Coalition is trying to prevent nearly 150 wooded acres in southeast Olympia from becoming two subdivisions. The coalition is focusing on the southern parcel, known as Bentridge. Supporters say time is running out for Olympia to buy the 72-acre Bentridge property and save it from development. The National Park Service is looking for an internal candidate to transfer to Seattle to oversee various programs including interpretation at the Klondike Gold Rush National Historic Park. According to the job posting, the job comes with several other duties that require overseeing 12 employees and more than 70 volunteers. Some bad news for backcountry in the West: Some of the fish in the region's wild alpine lakes contain unsafe levels of mercury, according to a new study by the U.S. Geological Survey. In the broadest study of its kind to date, the USGS tested various kinds of trout and other fish at 86 sites in national parks in 10 western states from 2008 to 2012. The Recreation and Conservation Office is accepting grant applications through PRISM Online to build parks, trails boating facilities and shooting ranges, as well as grants to conserve wildlife habitat and working farms. These grant programs are the largest source of state funding for many of Washington's outdoor recreation experiences, and the only state funding aimed at conserving farmland. Wondering which grants are available this year and which programs will work for you? Check out our Web site and contact an RCO grants manager who can help you decide.